Lt. Leonard Diamond (Cornel Wilde) is trying to break the combination, going after its sinister boss, the smooth and sadistic Mr. Brown (Richard Conte). He’s also in love with Brown’s girl, Susan (Jean Wallace). No matter who he goes after — whether it’s Susan or Brown’s right-hand man McClure (Brian Donleavy) or his cold-blooded henchmen (Lee Van Cleef, Earl Holliman) — he can’t seem to get anyone to crack. Until he learns of a name: “Alicia”… a name shrouded in mystery and murder. In my first review I wrote, “I’m tempted to rate this a notch higher, but I think I’ll wait for a second viewing.” That second viewing has come, and my rating is indeed higher. 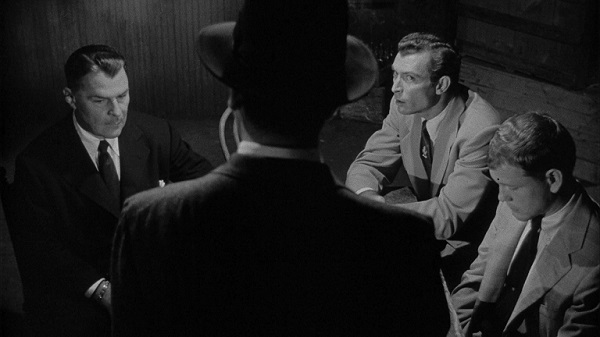 Despite the lack of a femme fatale, this has just about everything you could want in a noir. Conte is at his absolute peak here, snappy and brutal and riveting. Wilde also does some of his best work as the driven detective, and the entire supporting cast is loaded with fascinating characters. Previously I called Wallace “weak” but this time around I really liked her. She’s a bit like Veronica Lake… but less glamorous and more tragic. There’s a deep despair underlining her performance as a woman trapped by her connection to Conte. This entry was posted on October 16, 2013 at 7:49 pm	and is filed under Movie Reviews. You can follow any responses to this entry through the RSS 2.0 feed. You can leave a response, or trackback from your own site.